Potato salad is a dish made from boiled potatoes and a variety of other ingredients. It is generally considered a side dish, as it usually accompanies the main course. Potato salad is widely believed to have originated in Germany from where it spread widely throughout Europe and later to European colonies. American potato salad most likely originated from recipes brought to the U.S. by way of German and European settlers during the nineteenth century. American-style potato salad is served cold or at room temperature. Ingredients often include mayonnaise or a mayonnaise-like substitute (such as yogurt or sour cream), herbs, and vegetables (such as onion and celery). German potato salad, or "Kartoffelsalat" is served warm or cold and prepared with potatoes. Potato salad from northern Germany is generally made with mayonnaise and quite similar to its U.S. counterpart. In Southern Germany, it is made with bacon, vinegar, salt, pepper, vegetable oil, mustard, vegetable or beef broth, and onions. 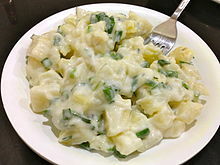 In Czech Republic, potato salad is generally made from boiled potatoes, hard boiled eggs, carrots, pickled cucumbers, onion, parsley, celery and mayonnaise. Green peas, some salami, salt, pepper or yoghurt are sometimes added too. Salad is served cold. American potato salad most likely originated from recipes brought to the U.S. by German and European settlers during the nineteenth century. Print evidence confirms that recipes for potato salad were often included in 19th century American cookbooks. Ingredients for traditional American potato salad include cubed boiled potatoes; mayonnaise, yogurt, or sour cream, yellow mustard and/or dry mustard powder, black pepper, salt, celery seed, sugar, dill, pickles (pickled cucumber), chives, red or white onion, green or red bell pepper, celery, and sometimes chopped hard-boiled eggs. Vegetable ingredients (not including the potatoes) are diced or chopped and incorporated raw. The salad might be topped with paprika and chives, and is generally served cold. Wikimedia Commons has media related to Potato salads. ^ a b "» Potato Salad: History". www.guampedia.com. Retrieved 6 March 2017. ^ a b c Olver, Lynne. "The Food Timeline: history notes--salad". ^ "American Potato Salad Recipe". kraftrecipes.com. Retrieved 6 March 2017. ^ "The Food Timeline: Potato Salad". /www.foodtimeline.org. ^ "» History of Potato Salad". www.guampedia.com. Retrieved 6 March 2017. This page was last edited on 21 April 2019, at 17:50 (UTC).